In 2015, nearly 85% of the U.S. knee implant market was taken up by a consolidated competitive segment of popular players, which included Stryker Corp, Smith & Nephew, Zimmer Biomet Holdings, Inc., and Johnson & Johnson. According to Transparency Market Research, this consolidated market scenario is expected to remain the same over the coming years due to a strict regulatory framework, and the high costs of development and implementation. The leaders in the U.S. knee implant market are known to hold a highly detailed product portfolio in not just knee replacement, but in the healthcare and medical devices industries as a whole. This allows them to diversify their profile through cross-selling and thereby maintaining a higher demand and loyalty rate. 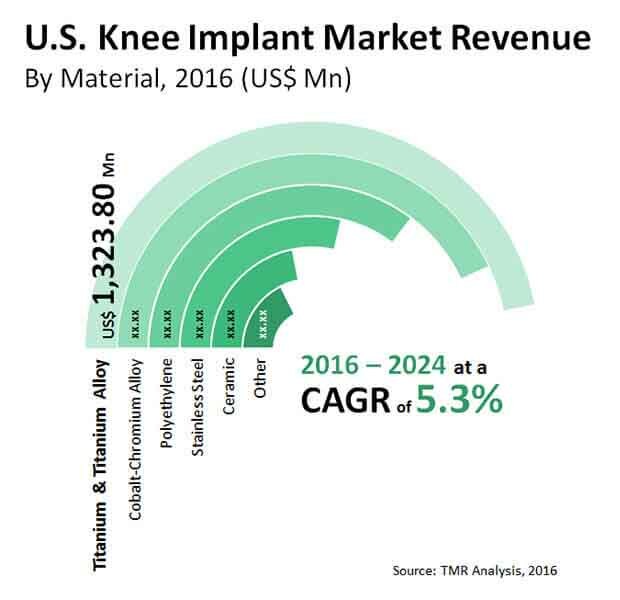 The TMR report states that the U.S. knee implant market is expected to reach US$7.0 bn by the end of 2024, after calculated to be expanding at a CAGR of 5.3% in terms of market value, within a forecast period from 2016 to 2024. The market was also calculated to have reached US$4.62 bn at the end of 2016, owing to its several drivers at the time. “The primary patient pool that shows a commonly high demand for knee replacement procedures is the geriatric demographic. The knees are often vulnerable to excessive wear and therefore become highly susceptible to needing replacement. This fact, compounded by the growing population of the elderly in the U.S., is creating a massive surge in the overall demand experienced by the U.S. knee implant market,” states a TMR analyst. Additional factors that are creating a heightened need for knee replacements are accidents and other injuries that damage the knees beyond repair, and the growing count of patients with chronic diseases that lead to increased joint tension and wear. This includes the growing number of patients suffering from chronic rheumatic conditions, as well as the increasing count of obese people in the U.S. Further boost to the U.S. knee implant market is given by the introduction of advanced knee support devices that are currently generating a very high demand volume. Within the U.S. knee implant market, the Midwest region has been known to show a high demand for knee implants over the recent past. This trend is likely to continue over the coming years. This is due to the relatively greater ability of the region in delivering advanced medical support and using advanced implementations of knee implants. This region also holds a larger pool of manufacturers from the U.S. knee implant market. However, the U.S. knee implant market is currently being restrained by the increasingly stringent government regulations against the use of certain materials, or the use of certain manufacturing procedures, for replacement knee products. The FDA has set up extremely strict mandates that players in the U.S. knee implant market need to follow, and this has been implied through the steady rate of product recalls made by the FDA. At the same time, the U.S. knee implant market is also receiving a setback from the growing popularity of non-surgical alternatives that are being sought by an increasing number of patients. “The future of the U.S. knee implant market is likely to lie in the growing developments on the scope of customization of knee implants and building support systems for them. One of the more invested portals to accomplish this is the booming 3D printing industry, which can be feasible for the manufacture of custom knee implants,” adds the analyst.